The Kopp sisters, Constance, Norma and Fleurette, live a quiet life out in the country. They tend to their farm animals and chores around the house, they mostly go into town only when supplies are needed. It's 1914 and the world is changing-fast. One seemingly ordinary day, an automobile crashes into their buggy while in town. The reckless driver turns out to be Henry Kaufman, an ill-behaved Industrialist armed with his very own gang. Following the crash, his constant threats and harassments shatter the Kopp sisters' quiet existence. Despite having bricks thrown through their windows and bullets flying at them, Constance does not back down. Constance learns how to shoot and intends to use her gun, if needed, to protect her family. 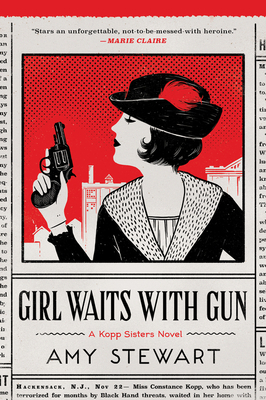 Girl Waits with Gun is a historical novel about Constance Kopp, the first female deputy sheriff. I could not put this book down. It will leave you wanting to know more about Constance and everyone else is this engrossing tale! Boswell presents a ticketed evening with Amy Stewart, author of Girl Waits with Gun, Lady Cop Makes Trouble, and Miss Kopp's Midnight Confession. Tickets are $17 and include any one of her first three books, or upgrade to her newest book, Miss Kopp Just Won't Quit, for only $24 and get a signed bookplate for when the book is released on September 11. More info at stewartmke.bpt.me.